Consumer demand for televisions with the ultra-high-definition 4K resolution will remain negligible for the foreseeable future, with shipments never accounting for more than 1 percent of the global LCD TV market during the next five years, says research firm IHS. Worldwide shipments of 4K LCD TVs are predicted to reach 2.1mn units by 2017, up from 4,000 this year, but still only accounting for 0.8 percent of global shipments by 2017. The sets are known as 4K (or Ultra-HD) because the televisions sport a pixel format of 3,840 by 2,160 – four times that of a typical high-definition set at 1,920 by 1,080 pixels. 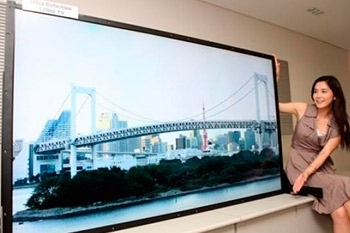 Unsurprisingly, it is the big Asian TV makers who are making the biggest splash here: Japan’s Sony recently announced an 84-inch 4K LCD-TV priced at US$ 25,000, while local rival Toshiba is offering a 55-inch model for US$ 10,000. Korea’s LG Electronics has also launched an 84-inch LCD-TV for $20,000, and Chinese brands Hisense and Konka plan to launch 84-inch 4K sets later this year. However, despite these launches and the wow-factor that will accompany them, IHS believes that neither consumers nor television brands will have the interest required to make the 4K LCD TV market successful. “If you have a television that is 60-inches or larger and are watching video that has a 3,840 by 2,160 resolution, then a 4K television makes sense,” said Tom Morrod, director, TV systems and technology research for IHS. “However, a very limited amount of content is available at the 4K resolution. Meanwhile, because of high prices and other issues, the market for super-sized, 60-inch and larger sets is very small—at only about 1.5 percent of total television shipments in 2012. Mr. Morrod also posits that leading television brands may be viewing 4K merely as a transitional product: “The 4K sets can fill the gap at the high-end of television brands’ product lines until the arrival of the next-generation active-matrix organic light-emitting diodes televisions (AMOLED TVs). “Japanese brands are offering 4K product because they need to have a competitive alternative to the AMOLED TVs being sold by their rivals in South Korea, Samsung and LG Electronics. Meanwhile, the South Korean companies are having difficulties producing AMOLED panels, saying they will need two more years to achieve competitive volume and pricing.